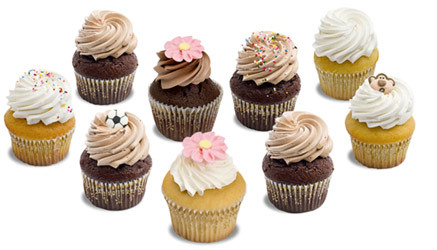 We love making cupcakes and are able to customize our cupcakes to fit the needs of your event, including weddings! Our luscious cupcakes are available in your choice of white sponge with a generous rosette of vanilla butter cream frosting or chocolate sponge with a rosette of chocolate butter cream. Standard toppings include your choice of colored sprinkles, jimmies, or sugar flower candies.